The Greek version of the popular translation buyers’ guide is finally available, both in print (contact us for a free copy) and to download. The first edition of the Translation, Getting it Right guide came out in 2000 and it was in essence a creative compilation of tips, primarily aimed at translation buyers with no linguistic background on how to avoid crucial mistakes when it comes to buying translation services. The guide’s tone is positive and helpful and its aim is to help non-translator readers (i.e. our clients) figure out how to go about preparing their texts before looking for a translator, how to choose the right translation provider, how to communicate with them, and in numerous other ways. In this context, Translation, Getting it Right is an important tool for any professional translator – apart from being a great way to explain the translation process to a client, it is also an excellent marketing tool; it can be used as a giveaway at events and conferences when meeting prospective clients. Check out a very nice article about the guide and its translations in the ITI Bulletin, May June 2014 issue, featuring comments by Chris Durban and the translators that have been involved in translating the guide in numerous languages. I met Chris Durban, author of the Translation, Getting it Right guide, at the ITI annual conference in Gatwick in 2013. Chris had originally developed this gem of a guide for the U.K.’s Institute of Translation and Interpreting when she was still the Public Relations Committee Co-Chair for the American Translators Association (ATA). We had discussed the possibility of my translating the guide in previous years, but that meeting in Gatwick was when I got the final ok to proceed. I was lucky enough to find an editor right away, the esteemed colleague Emilia Prekate, to take care of the proofreading of the Greek version of the guide. It was essential to keep the tone of voice of the English text. Another prerequisite was that the Greek guide should match the English guide as far as style was concerned. That simply meant we needed to keep the word count close to the English. As the word count in Greek translations tends to be 20-30% more, it was obvious that we would need to cut text. We decided to proceed with the translation and proofreading and deal with the character restrictions at the end. I finished the first draft (well, the 100th draft to be more accurate; the translation took a few days and the proofreading from my part took about a week…) of the translation, Emilia proofread it and during that process Chris was supporting us with feedback on questions. Then, we went through a few rounds of cutting text and re-editing and finally, Chris sent the final draft to Mark Richardson, the art editor of the ITI Bulletin, who created all versions of the brochure (aside from Japanese and Russian) published since 2011. Mark’s work has ensured that the guide has the same style no matter what the language is… and it is now available in 15 different languages! Before, during and after the translation process, I have kept thinking about all the different ways we (all translators) can use this guide as a marketing tool, especially during our communication with prospective clients. It’s a brilliant client education tool. Instead of complaining about how our clients don’t understand the importance of our work, how clueless they can be in terms of the translation process, we now have all the answers in a handy guide that we can give them for free as a nice little gift. “There are hundreds of ways a translation project can go off track – ridiculous deadlines, misapplied machine translation, poor project management. You know because you’ve seen it all. But have your clients? Be sure they know the value you bring to their business and keep them coming back. Client education is one of the best ways to build your customer base, and it’s easy to do with the Translation: Getting It Right mini-guide”. ATA members can order 10 print copies of the guide for free and ITI and other associations might have similar offers for their members; contact them and find out how you can get your free copies for your (existing or future) clients. 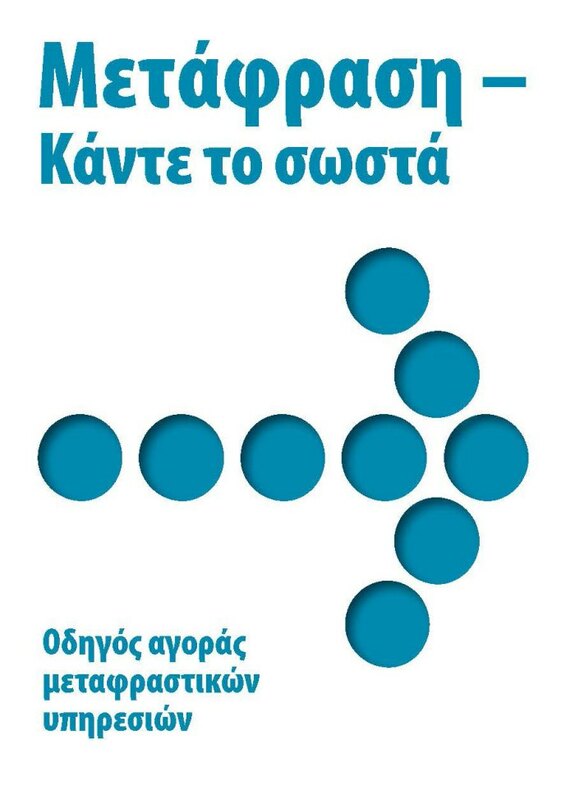 We plan on ordering a whole bunch of both the English and Greek versions and, combined with our company brochure, give them out to the many non-translation networking events we intend to attend in 2015. Dear translator readers, how will you use your copies? Will you send them to clients by post, will you give them to existing clients to strengthen your relationship? This is cool. Thanks for sharing this.